As the end of the year approaches, I find myself seeking some sort of summary. It has been a testing year - full of anxiety and uncertainty - and these walks have been beacons of a sort. Marking time against interminable bureaucracies, counting backwards away from grief and disappointment. Things are changing - there are, it's fair to say, many things which are cautiously approaching resolution. But I find these walks take me out of the churn of more pressing things, into a parallel channel which flows at a different pace. Sometimes challengingly faster, sometimes surprisingly ponderous - but always a change. Today wasn't promising in many respects - it started between storms at a windy railway platform, and by the time my train crept into Paddington a little behind schedule a grey drizzle had settled in for the day. This was punctuated by sudden squalls of rain, whirling and eddying whenever I strayed into an even moderately open area. It wasn't great walking weather - but I was determined to walk. Grim determination or foolhardy stubbornness? Hard to say at this early stage. It was though, pleasant not to have to rely on onward transport to get me to the beginning of the trek. As I was setting out from Paddington on foot, I tarried long enough to get coffee before leaving the station and doubling back along London Street. Beside the hulk of the trainshed I encountered a curious item of street furniture: a three-troughed, circular urinal which rose from the ground - presumably for those weekend evenings when inconvenienced men are more than willing to decorate any vertical surface without much concern about bystanders. I didn't tarry here - though I wondered whether its use in the busy daytime would catch on? I think we'd need to become far more shruggingly European for this to become a fixture. Instead I pressed on, skirting the edge of St. Mary's Hospital and diverting around workmen who appeared not to have decided if they were dismantling or erecting a building beside the station. Via an unexpected zig-zag I crossed Paddington Basin - my first sight of water - and used the backstreets to regain the canal near the complex mess of junctions on Harrow Road. As I plunged beneath the flyover, I delighted in the sudden muting of the traffic. The scour of tyre on wet tar was turned into a dull rumble. If nothing else, today promised to be a peaceful excursion. Shortly after joining the canal I found myself at Brownings' Pool - or Little Venice as it's quaintly known. The canal broadened into a trapezoid pool with a small islet anchored midstream. Around the towpath, expensively decorated narrowboats were moored, presumably laid up for the winter now. Here I had a final choice - head west along the Grand Union to Birmingham and beyond, or to maintain my planned course east for the Thames. I resolved to stick to my plan and turned east, soon realising that the towpath on the eastern bank gave no access to the Regents Canal. The tidy but windswept Rembrandt Gardens fronted against the street here, and I slalomed their gates to gain Warwick Avenue and cross the bridge. Looking north I spied the sleek, modern tower of St. Saviour among the plaster-fronted villas of the western suburbs. It was time to take to the water. I'd walked the bulk of the Regents Canal before - years ago, I'd tackled the stretch around Regents Park to Camden, and in the dizzy Olympic summer of 2012 I'd walked from the eastern portal of Islington Tunnel to the canal's conclusion at Limehouse over the course of a couple of walks. But it had been a long time, and there were loose ends to join here in the west. It felt right to be tackling an uncomplicated circuit today - the familiar seen from a different angle is always comfortingly unnerving. This early part of the walk was though, especially disconcerting. After just a few steps on the canal I was driven onto the footpath of Blomfield Road, a sedate avenue of heavily pollarded trees which runs east along a private section of the canal which is designated as a permanent mooring. In the chilly grey morning, the little puffs of steam from the boats was strangely inviting - and someone, somewhere was cooking breakfast. Up ahead the canal disappeared under a glass-fronted restaurant and into Maida Vale tunnel. Excluded from the water again, I headed over the broad but oddly quiet Edgware Road and plunged back into the suburbs. The houses hereabouts were large and impressive, but as I pushed on into the hinterlands there was a sudden change, and I found myself walking beside a pleasant but obviously down-at-heel municipal development, with the canal in a deep chasm beside me. Looking down I could see curious concrete bunkers embedded into the steep wall of the opposite bank. The canal must be a strange neighbour in some respects. Another towpath diversion sent me overland again, emerging on the southern bank and walking along a raised walkway beside another housing estate. Hemmed in by railways, this area has been turned over to the National Grid, with the vast Lisson Grove complex of transformers and pylons filling a huge triangle of land. The wires hissed and shivered in the drizzle, a metallic tang in the air. You could smell electricity here - the slightly fried, plastic smell coming back to me from days in the Air Cadet hut deliberately overloading capacitors until they exploded. 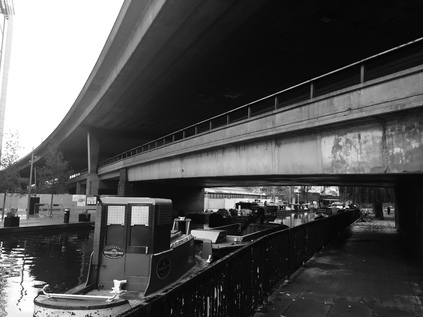 Passing under the Metropolitan and Chiltern Lines, and again crossing the canal, the area became much more sedate. A wooded channel taking a broad sweep around the margin of Regents Park, with the canal providing a view for a line of clumsy but impressive stucco mansions. Columns and domes proliferate - and while it's all done in the spirit of Nash, it has little of the style and grace his park villas provide to the area. The rain holds off a little and I can slush through leaves with the umbrella holstered for a while here, finally surfacing at the edge of the park where it meets Primrose Hill. My destination here was canal related - heading along the eastern fringe of the park via Prince Albert Road, following a long-deleted branch of the waterway which dived in towards the city. Now, the Feng Shang Princess dominates the junction - a bright red oriental-style boat turned restaurant which is anchored in the tiny inlet which was once the Cumberland Arm. By the mid-19th century, this branch built to serve Cumberland Market and the New Road was described as "no better than a stagnant putrid ditch", a haven of cholera-riddled boat dwellers. Later in the century it picked up the moniker of Jew's Harp Basin after a local public house. By 1941 though, it was filled in - used to absorb the rubble of the bombed city, its waters drained to feed fire-pumps. However the bridge remains, crossing nothing at all, but still adorned with elegant lamps and showing a distinct uplift in the carriageway of Gloucester Gate. I scouted the four pillars, looking down into the void below the road. North of the ghost bridge, the green edges of nearby London Zoo's overflow parking slipped away into foliage. To the south, trees and temporary buildings filled the view. The land beyond had been repeatedly and comprehensively redeveloped. There was nothing of the canal to be seen. I'd planned to retrace my steps here, but a glance around the junction had suggested that there might be somewhere to find food and conveniences here, so I wandered away from the canal. A mile or so later, I found myself in the midst of Camden Town and still no nearer finding what I was seeking. Camden was rammed with tourists ambling pointlessly, pointing cameras at everything, crowding on pavements and preventing walking in a straight line. A drizzle fell, but no-one walked faster. No toilets were open. Stores which usually had bathrooms had opted out - trying to squeeze every bit of retail space out of the tiny Camden shopfronts. After reaching Camden Lock, prematurely finding myself back at the canal having cut a huge corner, I turned and headed back. It felt like a long, wet and miserable slog back to Cumberland Basin, and I began to doubt the sanity of doing this walk today. Back on the tow path, somewhere in the midst of the long straight section leading to St. Pancras Lock, I sheltered under an overhanging walkway and reflected on my day. I was wet, a little tired of the wind and rain, but finally felt comfortable to press on. Walking the canal had felt like a safe November option, never quite leaving the comfort of Central London - but I should have known from previous walks that the water is sometimes a world away from the streets around it. 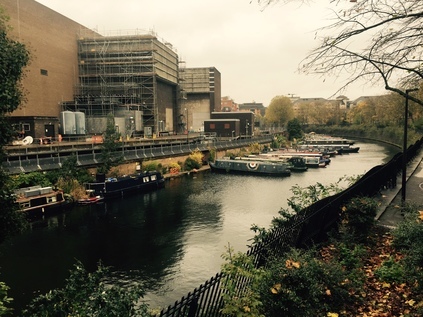 Certainly in Camden I'd felt the jarring discord - quiet green water versus busy streets above. I also felt like I'd been set back by well over an hour by the various diversions, and I began to feel pressed for time. 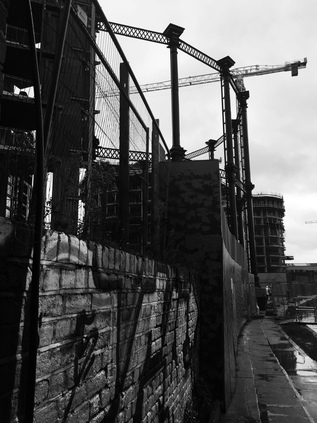 Moving on resolutely, I entered the redevelopment zone of Kings Cross Railway Lands. At St. Pancras Lock, the railways edge in to mark out a blighted zone which has always been industrial land. But slowly, and not without some confusion, it appears to be changing. A huge gasometer beside the towpath will house a new residential building, and the space around it is landscaped and stepped up to a public square. Quaint boats act as book stalls and coffee shops, and the canal benefits from a long stretch of floating towpath whilst the work continues on shore. Clanking around the curve, assuring myself that this was solid enough to carry a now steady traffic of people, I thought of St. Pancras Old Church, not far away here - and the fact that this was probably the closest I'd get to the centre of the city all day. There was still so far to go, and this had seemed like an easy option? Soon enough though, I was forced back to street level by Islington Tunnel - the long, dark void stretched away under Muriel Street, a tiny speck of distant light the only hint of what lay beyond. For me the route meant taking to the alleyways of Islington, diving between the radiating northbound streets and finally emerging at The Angel on familiar ground. A quick crossing of Upper Street, and I'm again in the backstreets and paying respects to the line of the New River at Colebrooke Row. Thinking back to a walk here long ago, and the more recent Olympic jaunt, I found myself reminiscing - so much had changed, but the canal was a constant. Back on track at the tunnel's eastern portal and with the rain mostly holding off, I widened my stride for the more familiar section of the route through Hoxton and Shoreditch. I'd walked this way before, and knew the risks: cyclists and joggers, in surprising numbers, frequent this part of the path. I tucked myself into the wall and put my head down, slithering carefully over the stones when the path dropped at locks. My feet were sore, and I was soaked through - not ideal walking conditions - but the silvery skies didn't signify immediate rain and the going was more pleasant here. I ticked off progress by basins - City Road, Wenlock, Kingsland - paying little attention to anything beyond my immediate path. Little businesses had cropped up here and their exploiting the busy path, but mostly it was me, walking steadily, with a successing of dinging bicycle bells the only punctuation. This was much, much better. Soon - and rather surprisingly the gasholders of Andrew's Road were dominating the view south, and I felt relief. Whilst there was still a fair way to go, this was the part of the city I felt I knew better. The canal-based businesses here weren't trading much today, closed up with little wisps of smoke coming from their chimneys despite the passing walkers and cyclists. Passing under Mare Street marked a boundary for me - I was back in territory I could navigate easily. Victoria Park beckoned, and a welcome rest on a drying bench near the boating lake. I recalibrated myself, drank the last of my supply of water and wondered if my feet were really up to this last push? It was later than I'd planned - and I still had one little side-trip to complete. Reluctantly I eased my knees straight and started walking towards the Old Ford gate. My ambitious plan to include a side trip into Meath Gardens seemed ludicrous as I slogged along the path through Mile End Park. The former cemetery had figured in my recent reading, and I realised I'd never really been into the park. Access now was via an elegant, curving footbridge which lead into a development of new apartments around the edges of the park. Soon, I was level with the railway line from Liverpool Street, crossing the canal nearby. The view was surprisingly good - north along the green line of the park, to Wennington Green where Rachel Whiteread's 'House' so briefly stood, and south towards the Thames, the glowering silver towers of the Isle of Dogs dominant. As I scuffled into the park I was startled by a weird dummy posed oddly on a balcony of the new flats. I stopped sharp and my foot twanged. Any hope of an exploration of the park was scuppered. This was now an endurance test. I headed back over the bridge and descended to the towpath for a last, desperate push towards the river. This stretch of the canal is interesting but somehow unrelenting - the north/south geography of the City is exchanged for an east/west axis and the canal cuts, serene and still, across this. For much of the route, work to repair the waterway meant it had been drained to a trickle, and it was both disturbing and interesting to see the detritus of the canal bed exposed to the world again. When I thought of some of the horrors which this stretch of water had endured, I wondered about the apprehension of the workers as the levels started to fall. Just what they'd find a total mystery. In a sudden burst of sunshine, reflected back at me by the nearby pyramid of One Canada Square, I burst out from under the narrow bridge walk-way into Limehouse Basin. The ending was fittingly quiet, and I sat on a nearby stone bollard trying to lift one foot at a time off the cobbles. I thought about circling the basin and heading for the river, but my feet just weren't up for that kind of additional, ambitious jaunt. Instead I rested, then headed for Commercial Road where I knew a bus would take me to dry seats, coffee and rest. This walk had seem innocuous, a re-linking of past trips and a fairly sensible distance when I set out. What I hadn't perhaps appreciated was the need to deviate from the solipsism of water just to get the job done. The dispiriting walk into Camden and the unnecessary diversions were of my making, but the canal imposes these fractures on the walk too. Perhaps the real folly was trying to walk from West End to East End like this, so brazenly challenging the city's own rhythms. In any case, I felt like I'd achieved something in just staying the course. 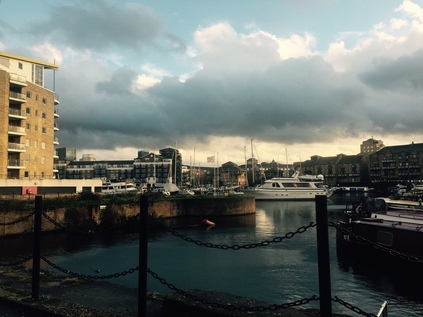 This was likely to be my last walk in the city for a while, and once again London had challenged me.